To battle the dreaded Mommy Brain and the feeling of being a factory farm dairy cow, I have stocked my breast pump bag with research for my stalled work in progress. In 15-minute pumping sessions, I'm reading a biography of Charlemagne, Beowulf, and the Nibelungenlied. Reading ancient texts really puts life in perspective. Sometimes I think, "Wow, I'm sure glad I live in modern times!" when I read about things like the life expectancy of 25--yeah, 25 years--in the time and place of Charlemagne's birth. People got married at age 12, had as many kids as possible, then quickly died in childbirth, in battle, or of disease. Yikes. At other times, I think to myself, "The Romans (who had a much better expected lifespan, especially in times of peace) seemed to get by fine without Desitin and Johnson and Johnson products a couple millennia ago. Do I really need to make another trip to Babies 'R Us?" Last week, Nux Gallica started to get a little diaper rash. We have a great cloth diaper service and haven't seen much diaper rash so far, but it appears on every set of baby cheeks at some point. I wanted to do something for it and didn't have any diaper cream, and then I was reminded in my classical studies that olive oil has great skin healing properties. Of course! I often use olive oil as a general moisturizer, especially on my legs after shaving, but it hadn't occurred to me to use it on baby buns. I rubbed a couple of drops on her diaper rash and also on a red patch under her chin that was irritated by spit bubbles, and the next day the skin in both areas was soft and almost completely rash-free. Reading ancient texts makes me oh so thankful for modern miracles like immunizations and modern plumbing, but it also reminds me often that there are simpler ways to do things. It's interesting how doing research for my writing can give me parenting tips and how raising a baby is also enriching how I write my characters with children. Being a mommy and a writer can benefit each other in strange ways. 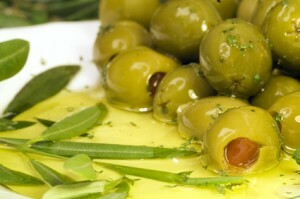 Olive oil is such a wonderful thing! I add a little to lotion that's almost out, to finish out the lotion in a delicious way. That's a good idea too, Karen. I should have titled this post "Gettin' Medieval on Your Heinie." Marinade the baby in olive oil for juicy fle-I mean skin! Babies basted in olive oil are delicious. It's true. I cannot wait to nom nom on her legs! I hope your first "Mother's Day" with your little one was wonderful. Wishing you many more happy memories. Please take a peek at my blog and follow if you can.